Most come for Safari or Kilimanjaro. The smart travellers discover the world behind the negative stereotypes and crowds. The people are friendly, getting around is easier than ever and visas are simple affairs. Ethiopia is something special, Lakeside Malawi is chilled, Rwanda is stunning... and then there are the great grasslands and animals. (Zambia and Zimbabwe in Southern Africa section). You can also see West, North and Southern Africa in other sections. In many ways East Africa is Africa. This is where you will see the landscapes and animals that are so imbedded into our heads as what Africa is all about. What shocks many is that travel is not cheap - despite the clear level of poverty - and normally getting to most of the iconic locations and animals requires long distances, high park fees and joining a tour (or having your own camping gear and transport). What is really great about East Africa is that there is so much more to discover that you won't be expecting. English is widely spoken, people are open and friendly, cultural differences are pronounced and countries like Rwanda and Ethiopia are developing at a crazy pace. Furthermore you just don't get the huge numbers of young backpackers found in Central America or Southeast Asia. Thus the real Africa you discover is within the sleepy villages aside numerous lakes/mountains/coffee plantations, in fast growing cities and with the personal revelations that Ethiopia is far from a wasteland and Kenya is not a total no-go area. What follows are only basic snap shot summaries. If you have decided these are some of the countries you want to visit and need more planning information then you are strongly recommended to complement what you find here with a planning guide. Trust us it will make life much easier. If you are set on going and need a guidebook please see a list of recommended guides here. All books can be viewed in more detail and click-through purchased with Amazon in the UK, US or Canada. Buying through the site is a big thank you (if you have been helped out), to see why click here. Intro: There are few countries covered on this site or in the world as misunderstood as Ethiopia. It is hard to know where to begin in summarising a country like Ethiopia and sadly you have to begin by explaining how it is not, before you can explain how it is. Even then it is hard to begin, with most minds conjuring images of the 1985 famine, deserts and the dark spectres of Africa - images that have unfortunately become synonymous with Ethiopia and indeed most of the continent. Ethiopia, like most of Africa, is desperately poor and yes parts are desert, but for the rest and the areas of most interest to travellers, it is a fertile high altitude plain (providing ~80% of the Nile's water, no less) and what is lacking in road infrastructure, 4 star hotels and country wealth is made up for by a rich and unique culture, intriguing history and welcoming people. Contra to popular belief, the high plateau which forms central Ethiopia - and for years kept it a virtual mountain kingdom - supports a huge population (Addis Ababa, the capital, is the 3rd highest on a global scale and the population ranks only behind Egypt and Nigeria on the continent). There are deserts (including Africa's lowest and most consistently hottest point), extending from Northern Kenya and Somalia, but they are thinly populated and few travellers ever see them. 90% of what is interesting in Ethiopia is in the highlands and it is the most widely travelled area. Looking very different than you might imagine Ethiopia to be, the highlands have high mountain plateaus, a moderate climate and, depending on the time of year, are pretty green. Emerging from the 'Scramble for Africa' as one of only two African countries never colonised by a European power (the other being Liberia, which was a American quasi-colony), and with several hundred years of self-imposed isolation in its history, Ethiopia is as unique as it comes. Thirteen months in a year, a clock starting each day at six rather than midnight, Gregorian calendar never adopted... are only a few examples of such, with practically every facet of Ethiopian culture being unique. Ethiopia was also home to one of the world's great empires (Aksumite) with historic ruins abounding and is the world's second-oldest Christian country with examples of Christianity and religious fervour much closer to Christianity's Middle Eastern, Judaic roots than the Vatican inspired version we are familiar with today. The medieval capital of Lalibela with a cluster of churches carved deep into rock (putting Petra to shame) is at certain times of the year one of the most atmospheric and extraordinary places on earth. There are also 17th century castles, interesting food, small friendly towns, a lack of malaria at altitude and some breathtaking scenery - with every flight or bus trip in the highlands a jaw dropping treat. Ethiopia is extraordinary and highly misunderstood. It is poor and parts might bring to mind Niger or Mali and cause sudden spasms of guilt. But people are friendlier and more relaxed than in West Africa and even big cities are fairly calm and neat, a far cry from the chaos in the likes of Bamako (Mali), Lagos or even near-by Nairobi. Infrastructure is equally poor, partly due to the terrain, with bus rides between major points taking long days (or two). However, a great network of cheap internal flights gets you most places with ease. It is not the perfect travel destination by any means and many of the short-comings of African travel are present. Yet for independent travellers it is cheap and easy with okay facilities for the most part and obviously it's fairly uncrowded. Visiting Ethiopia is not only a revelation, it is humbling and like travelling through time - travel at its most interesting. The jury is out on: The tribes of South Omo such is the cost and effort of getting there. As unique and fascinating as the tribes are, constantly paying to take photos and the feeling of being in a human zoo sometimes can outweigh the interest. Highlights: Lalibela (Lal-e-bell-a) with it's churches caved deep into solid rock, stream of pilgrims and remote location (rock hewn churches at Tigray remoter, less touristy and with stunning surroundings). The scenery, with the Simien Mountains being the most spectacular, anywhere in the highlands being a visual treat and easy to explore at random from towns/villages. The people, culture, convenient flight network and of course the coffee. Visa strategy: Most nationalities need a visa, available for about US$50 at the airport (a photo and yellow fever certificate is often listed as necessary, but never required in our experience) - make sure you have US$ to pay and time to spare as queue can be long, any other currency you will need to change into US$ to pay for the visa. Note that unlike a Kenyan visa, an Ethiopian visa cannot be issued at the border and if coming over land you will need to arrange in advance. 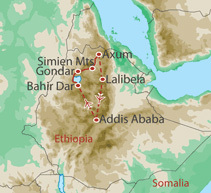 Typical tourist trail: Ethiopia has four obvious points of interest within the highlands (aka. the historic circuit): Bahir Dar - from where Lake Tana and the Blue Nile Falls are accessible. Gonder with its castles and access to the Simien Mountains. Axum and of course Lalibela with its rock-hewn churches. You could also add Addis Ababa where most arrive. Addis aside, using internal flights, there is no specific order in which you need to visit these destinations. Many internal flights serve one or more of the above en route to another and with flying being such an advantage you will continually meet the same people on the road/airport. Some travellers add Harar to the above if they have more time and those with money/transport might head south towards the tribes of South Omo. Public transport: In comparison to the GDP and other African transport, public transport is actually pretty good. Ethiopia is one of only a few countries we know of in Africa where it is illegal to stand in the aisle, thus buses don't get too crowded. Equally the practice, so typically African, of stopping every half km to pick-up or drop someone off is fairly rare. Overall buses and mini-buses are very cheap, have regularly organised breaks and overnight stops. The problem is not the buses or their ridiculously early departures, the bumpy roads or even the perilous mountain routes - it is quite simply the distance. Ethiopia is huge and getting around even the basic sites (including Axum) is going to take around 10 days of solid exhausting bus travel. Mini-buses are less common and faster than buses, generally used for shorter trips, where they can be used to 'town-hop' in order to get off the beaten track and avoid long stretches in a bus. Air: Flying is by far the easiest and most efficient way of getting around Ethiopia. Even if you might prefer to travel overland and 'see' the country, buying a couple of flights for difficult legs makes a huge amount of sense and saves mountains of time. Equally by booking flights between all the main points of interest, a 3-4 week exhausting overland trip can be made into a relaxed 10-14 day short holiday. Ethiopian Airlines has a good domestic network (see route map) and you can get to most places of interest even if you have to make a stop-off before reaching your final destination (a change of plane is not necessary). It is impossible to comment accurately on availability of flights. Many find flights even the day before departure, but given the alternative, best advice would be to book what you need before you get to Ethiopia and if flying with Ethiopian Airlines internationally to Ethiopia, with your international ticket (for the cheapest fare). You can book multi-leg e-tickets with ease on the Ethiopian Airlines website, pay by credit/debit card and relax (make sure you have the credit/debit card which you booked with for presentation at your first flight). It is also impossible to comment on prices, which have been creeping up. Good value (given the distance) is the norm, but some dates and routes give crazy high prices. 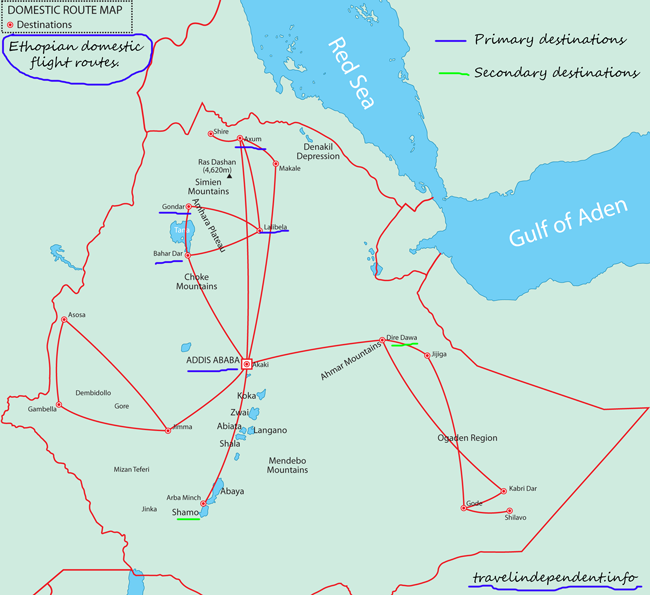 For the northern historical circuit, have US$250-400 in mind - but go to the Ethiopian Airlines website yourself and check some dates/routes. Car Hire / Private transport: Public transport can only take you so far in Ethiopia and if you want to get off the beaten track or travel at your own speed with any comfort, you will need a car and driver. This could be as simple as hiring a car/driver to head out for an afternoon or day trip/tour, or conversely for longer to get somewhere like South Omo. Hiring a car and driver is not cheap by Ethiopian standards and travellers normally club together to split the cost. There are plenty of guys offering their services and if you can share between three or four then costs are manageable. If however you need a vehicle (possibly 4x4) for several days, with no one to share with then costs soon push beyond the realms of budget travel. You can be looking $100-200 USD a day. The highland/historic circuit is effectively all the main 'must-see' sites and the 'standard' Ethiopian trip. This circuit which comprises of Addis to Axum and back, taking in Bahir Dar, Gonder and Lalibela on the way, can be made in a variety of orders (with little discernible price difference) via Ethiopian Air internal flights or by overland transport, or a combination of the two. However, it is important to remember that distances are huge and most road surfaces are poor. First stop Bahir Dar, which you will find several flights per day from Addis taking an hour or so. Via bus the trip takes two (long) days (note that this is two separate days, as buses will not travel overnight and will stop for you to get a room to sleep during the night). There is now a mini-bus service, that is faster and can make the journey in one (very long day). En route there are several points of interest, but without your own transport you won't get to stop with ease. Next stop is Gonder (note you could skip Bahir Dar completely and fly directly to Gonder from Addis) from where you can fly from Bahir Dar in no time at all. However, the road is now sealed the whole way and takes only about 3-4hours (185km), with some guesthouses in Bahir Dar arranging mini-buses for tourists. From Gonder, north to Axum, the overland route is not so easy, taking a full (very long) day, with a change in Shire. The road is unsealed and through the heart of the Simien mountains. Note that from Gonder the Simien mountains are accessible as a day-trip by private transport. In Axum you are a stones throw from Eritrea and over 1000km from Addis. From Axum the next main stop is Lalibela, which is famously inaccessible. In 960 there was no road and only since 1997 can you fly in all year round; still today Lalibela is not connected to any other town by an asphalt road. By road and public transport you need two (full) days from Axum or Addis or one day from Gonder or Bahir Dar. Either way it is tough by road and with several daily flights in all directions, far from appealing. In short making the above circuit by public transport on a bus would take 9-10 solid (waking) days, covering around 3000km! Via air (despite pointlessly long check-in times and security) 5-6 hours combined. One option is of course much cheaper and much more of an adventure than the other. Hot/cold, wet and dry: Ethiopia has a hugely varying climate, ranging from the hottest and lowest point in Africa (the Danakil Depression) to one of the highest (Ras Dashen). Variations aside and concentrating on the highlands and main points of interest mentioned above, you can visit anytime of year and the climate is moderate. Rains come from June to early October, but with the rains come far fewer tourists and a wonderfully green countryside. September to October is particularly gorgeous, however most visit from October to January. Daytime temperatures are between ~20-30 degrees C in the highlands and you definitely need a sweater at night and warmer gear if heading to higher altitude. Off the main tourist circuit the lowlands and South (Omo) roasts most of the year with rains in April and May. Money: For long Ethiopia was famous as one of those places you still could not use an ATM. This is no longer the case with Dasen Bank adding international ATMs in Addis, Gonder and a few other cities. However, as great as a back-up as this is, with so few ATMs, aim to take most of your funds in USD/EUR cash and travellers cheques (as always bring your receipts). You can use a credit card to get cash in some banks and to pay for international hotels in Addis - as you might expect a surcharge is normally added. Costs: Ethiopia is indisputably cheap, but developing at a break-neck pace - so getting more pricey every day. It is still far cheaper than the rest of East Africa and Euro/CFA linked West Africa. Costs would be somewhat akin to Nepal or Malawi. There are few temptations in where to stay or what to eat or drink. Quality is lowish, but many prices are rock bottom (although a decent room in touristy cities is impossible to find for under 200 birr now). However, all but the most long on time (and/or with suicidal tendencies) will want to take at least one internal flight in the highlands. Flights are excellent value, but if flying between something like the major sites (Addis/Gonder/Axum/Lalibela/Addis) this will set you back US$250-400 (combined) depending on the routing and when you book. Equally entrance fees to the churches in Lalibela (trebled in recent years), monasteries on Lake Tana islands and historic/religious attractions in Axum will be far more than you would spend in several days of comfortable living and do add up. Other surprises are the cost of accommodation at peak times, particularly in Lalibela during Christmas, Timkat or the Ethiopian New Year. Equally any travel in a private car, 4x4 or mini-van that you need to reach off-the-beaten track destinations or anywhere not served by public transport will be expensive (the more travellers you can find to share with the less so). Worth noting is Ethiopia is currently suffering from major inflation and although most costs here are quoted in USD and should be reasonably accurate guidebook costs will likely all be wrong. Guide book: There is both an up-to-date Lonely Planet and Bradt guide. The Bradt guide is superior in every way and stands out alongside Philip Briggs' other guides as a cut above the rest, such is the knowledge and passion conveyed. Locals: The attitude of Ethiopians to foreigners (faranj) generally takes one of three veins: indifference, friendliness or over-excitement. At a basic level, Ethiopia is a poor country and those needing to earn a living or with some level of English will want to talk to foreigners for some ends. Sometimes this can be interesting, other-times it can be quite annoying after a while. If you do find the right people and connect, you can see just how friendly, warm and welcoming Ethiopians are. The only problem is that most of those whom seem initially friendly want something. As for over-excitement this normally comes from children running after you (everywhere) and if you get anywhere even slightly of the beaten track, being a major novelty and getting a lot of attention (normally shouted comments). However as always the actions of the few make a far greater impression than the many, who like people anywhere around the world will just be trying to get on with their lives unless for some reason your paths cross. Other travellers: You'll find a good mix of Europeans and North Americans. The general age of backpackers is much older than in say South East Asia and there are many middle-age independent travellers. Ethiopia is not a common destination, but since the typical route is well defined you'll come across many other tourists in certain locations and it is easy to meet interesting people. This is particularly useful for finding others to share transport with. Accommodation: Finding a room in Ethiopia is pretty easy, however it helps if you are not fussy. In all the main towns on the historic circuit you can find an okay standard of cheap hotel and a few tourist (tour group) geared versions. In Lalibela and Addis you can find an excellent standard, although with prices to match. Off the circuit you would need to accept a basic option, but even by African standards they are always very cheap and clean (spartan, cell-like with communal toilets). In all instances it might be the case that tourists are charged more than locals, but for an okay double room with a bathroom (outside a major holiday period), a room for US$10-20 is easily found and many places on the historic circuit are increasingly traveller geared, offering free airport pick-ups, tours and onward transport (but with more hassle from locals and higher prices!). It is hard to explain South Omo and its unique tribes - it is certainly very different from the rest of Ethiopia (if not the rest of the world). Located in the far south in the low lands where travel is strongly limited by seasonal factors (rain putting it virtually off limits), it is expensive and complex to visit. This is Africa how you imagined it to be (without the large game) - or at least how National Geographic led you to believe - a cultural Garden of Eden on par with very few places around the globe. South Omo is not somewhere you can explore casually. Jinka the administrative centre is easy to get to, but to explore further you need a private safari which is normally a guide and car hired (pre-booked) out of Addis. A minimum of eight days is needed, if not more. Expect US$125-225 per day for the car, driver, cook, guide and camping gear - luxury is not an option. Typical governmental advice at time of writing is not to visit. If you do go seeing the Erta Ale volcano up close and learning about the Afar people of the region are a definitely unforgettable experiences. Given the location visiting during mid-summer might be unforgettable for other reasons - this is the hottest place on earth (rear-round averages). Interesting, while at the same time being rather confusing, you will in the course of any travels note dates written on admission tickets and hotel check-ins, as being about seven years behind the year you are used to. Hence the phrase come to Ethiopian and be seven years younger!. The reason is that Ethiopia never adapted the Gregorian calendar (more info on Wikipedia). There are thirty days in each month with the remainder forming a 13th month. Likewise, time-keeping is also interesting, with the clock starting each day at 6 (rather than 12midnight). So 0600 in the morning translates to 12 and 0900 would be 3. Just deduct 6. It is more a point of curiosity rather than something with a significant effect on travel. Some bus departure times are quoted in local time, but Ethiopians are conscious that foreigners don't always understand their system and all official transport, like airplanes, work on the clock you will be familiar with. Media: Hawkers sell copies of Time and The Economist in Addis, equally you can find some English language books. Away from the capital there is almost nothing, although English and other football (soccer) leagues are popular and it is easy enough to seek out somewhere showing a game. Communications: Internet is fairly widespread with several internet cafes in major towns. Speeds are pretty slow, but standards, equipment and speeds are not bad compared to the rest of the country. Many will also let you make internet phone calls or burn CDs. Food: Ethiopian food is far superior to the normal bland foods elsewhere in Africa, delicious, easy to find, cheap and a serious novelty. The staple food is injera which is a pancake like breadish substance made from teff flour. This big circular pancake is topped with various curry-like dishes, as pictured. You tear the injera up as you eat with your hands, effectively eating the plate. Along with Ethiopian dishes you can easily find egg or chicken based dishes. Equally getting a piece of cake or even a (bad) pizza or pasta is not impossible on the beaten track. Vegetarians: Finding great veggie food is easy as Wednesday and Friday are the Orthodox fasting days when meat is abstained from. Every day of the week you can find an injera dish with a variety of vegetarian toppings (as pictured). Simply ask for 'fasting food'. Coffee: As history would suggest (this is the home of coffee), coffee is found everywhere for next to nothing, often roasted in front of you and is simply amazing. Hassle and annoyance factor: Travel in Ethiopia is not hassle-free, there will be beggars everywhere (although hardly ultra-aggressive). It is also hard not to be left alone without being approached by someone (very friendly) wanting to practice their English or offer you some service. Most frustrating of all are the constant cries from children for 'one pen' - which is more like a game rather than a serious attempt to get a pen (please read the responsible tourism comments). It is all pretty harmless, even when you are the centre of attention, but the most frustrating thing about the kind of foreigner hysteria that you can encounter is it immediately puts a barrier between you and your efforts to connect with locals. All in all it is not a patch on Rajasthani India and children are actually being taught explicitly in school not to hassle the tourists. Women alone: On the beaten track (historic circuit) with common sense, fine. 'Thrilled to see Ethiopia as an 8.5 - totally blew me away. Your summary is very accurate - who knows where the country's tourism industry would have been today without all those pictures we saw back in the 80s. People still can't believe there's anything to see there - until they go. I just hope that the tourist industry becomes developed in a sustainable way - very hard to balance what we term as progress with maintaining such distinct cultures. - Jason K.
'I would like to add some additional info: Ethiopian beers are pretty good as is some Ethiopian music. Fasting is not just limited to Wednesdays and Fridays - e.g., there is a 40 day fasting period leading up to Easter (Fasika). Avoid eating meat off the beaten track during fasting periods, - hotels and restaurants catering forr tourists in major centres are generally OK, but outside of these treat meat dishes with caution (during the fasting periods). If you are going to drink water, rather stick to bottled water. Omo tribes, - if that's your bag well go for it but exercise caution when choosing your tour company and avoid the rainy season. Some beautiful places: Semien - and Bale Mountains, Nech Sar. Paradise for birders. Access usually difficult and/or expensive (4x4). The downside is often more people and livestock than wildlife. But, the Semien landscape will blow you away, and the crocodiles in Lake Chamo (Nech Sar) are the biggest in Africa. Curios etc. : Be careful (VERY) about buying 'antique' religious icons/manuscript - most are fake, and if per chance real, it's illegal to take them out of the country. 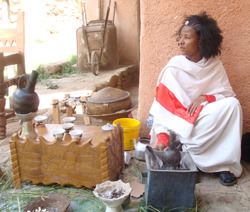 In Aksum a number of touts will hassle you constantly to buy icons or Aksumite coins. Crime: generally you're OK. In parts of Addis minor stufff like pick pocketing does occur. If you take normal precautions you'll be OK. Dangerous/violent crime is absent. In 5 years I've never had any hassles outside of Addis. Bus travel: Selam Bus is the best but you must book in advance. For bus journeys longer than 1 day, the buses stop at certain 'hotels' for the night. These are really "local" hotels, but foreigners using these buses are so few and far between that you usually get good service (in relative terms). TIP - these places mostly have communal ablutions, - try to be the first to use the toilet. There's no room service, but you'll be safe, and woken up in the morning. All buses leave at very early hours, but usually stop along the way for brunch. The biggest hassle (in Addis) is arranging for a taxi to pick you up and to drop you off in time to catch your bus at 5/6 in the morning. Many thanks to Derek Clark for sharing his knowledge and experience. Rock hewn churches at Tigray: These are just as interesting to see as those at Lalibela, are less touristy, and in a more remote location. The mountains surrounding these churches are absolutely stunning and look very similar to the cliffs at Zion National Park (in the United States). Hiking and rock scrambling are required to get to a few of the more intriguing churches. If you have time, you should try to spend a few days in both Tigray and Lalibela. Going here means hiring a local guide and private transport (you cannot get to some of the churches otherwise). Danakil Depression: The US state department website discourages travel into this area (I think the Canadian and UK ones also do). We decided to go anyway (after consulting with a friend who had just recently travelled in the area) and found it one of the highlights of the trip. We felt fairly safe (the most dangerous thing was likely the heat). Seeing the Erta Ale volcano and learning about the Afar people of the region were definitely unforgettable experiences. Hotel reservations: Since we were travelling during high season (over Ethiopian Christmas), we pre-booked a few hotels on the hotel websites. Unless you pre-paid for your booking (most hotels do not have an online payment mechanism), you must reconfirm your booking (via phone) the day before you arrive. Otherwise, the reservation will be given away. We spent an hour or two in a few of the towns looking for decent open rooms after finding out our bookings were cancelled! Exchanging birr: Birr is very challenging to impossible to exchange at the airport, so try not to have too much birr left when departing the country. Hassle: We have travelled extensively in developing countries and found the begging and hassle factor to not be as bad as we feared (certainly not as bad as Rajasthan India!). In some of the cities we travelled to, we were told that children are actually being taught explicitly in school not to hassle the tourists. Many thanks to Jennifier Louie for sharing her knowledge and experience. Intro: The entry or exit point for most overland trips in Africa and a favourite package safari destination - in many ways Kenya is East Africa. Even though a look at the map may reveal that many of the more evocative place names associated with the region lie in neighbouring countries - there is no doubt that Kenya with its compact tourist circuit, safaris cheaper than Tanzania and fine facilities should not be over looked as they so often are (amidst concerns over crime). With 'back in time' trips to lake Turkana in the north, amazing beaches/islands on the east (inculding the wonderful Lamu islands) and fine national parks / lakes all over the country - it's worth spending some time. Ignore anybody who tells you Kenya is too touristy - you simply need a little courage and to make the effort. Off the beaten track (if you have time) Kenya is amazing and quite safe. Highlights: Samburu NP in the north is highly rated since there is a good chance of seeing the 'big three' away from the plains and the road trip from the south takes in a diverse range of landscapes from lowlands, beautiful white highlands and stunning Mount Kenya. Some prefer the heavily touristed Kenyan extension to Tanzania's Serengeti, the Maasai Mara - which are an amazing example of iconic African plains and Africa's best value safari . Best advice if you have the money is to visit a few national parks. Lamu is so relaxed it's almost falling over, a great add on even if you are going to Zanzibar. A trip to lake Turkana in the far north (as seen in 'The Constant Gardener') is worth the money and Lake Nakuru with it's millions of flamingos really makes a typical east African site. Lowlights: Touristy package beach resorts, high rate of crime, poverty, clashing cultures, need for private transport when making national park trips and danger of mugging in the capital and some beach areas. Visa strategy: Most nationalities need a visa, available for about US$50 (single) or US$20 (transit) at the airport or border - make sure you have GBP, USD or Euros (which are now accepted widely) cash. You can also get a visa on-line before you arrive which cuts down on waiting time at the airport. Make sure you are on the right website when you apply as there are plenty of faux/clone sites established to steal your visa money. If you are planning on also visiting Rwanda, Uganda or re-entering Kenya you can apply for an East African visa for $100 which will allow multiple entries for 90days to all countries. You can get this at Nairobi airport, but it is not clear if you can obtain on land borders. Typical tourist trail: Three to seven day safari circuit taking in Maasai Mara, Lake Nakuru, Mount Kenya and Samburu, then on to the coast for a few days. The most compelling reason to visit Kenya, is to take a safari (journey). However this is an expensive activity for the budget traveller (although cheaper than in Tanzania). Expect to pay at least US$100 per day for a safari if you hit a very good deal, however US$120+ is nearer the mark. It goes without saying that pushing the limits of how cheap you can get a trip for, will often compromise it's quality. This sort of price will be camping, which is fine (in fact it's great) and require a full group. If you want fixed accommodation or a vehicle or a couple then you had better triple and more the per day price. The reason for this cost being so high is that like in all parts of East Africa you pay for 1) fuel for a very long trip, 2) a guide plus a cook and 3) most importantly up to US$60 per 24 hours (more in most popular parks) for park admission (plus fees for the vehicle and camping - you can check latest rates on the KWS website). Understand that you will be expected to tip at the end of your trip and therefore will need to budget for 5-10 bucks extra a day. Competition is fierce and any guidebook will recommend some established operators to haggle with. Perhaps the most sensible way to approach the situation is to make contact before you arrive, but if you can't, don't worry. A trip is easily arranged in Nairobi and the best deals can be secured when you team up with another group (normally trips work out cheapest when a couple has pre-booked from their home country at a premium and you turn up with flexibility and say 'I will go as well'). If you have some flexibility, there is no real reason to pre-book, since several companies offer daily departures and you would certainly be a fool to book via a company based in your home country that was listed top of the page when you did a Google search. As a final note, look at getting yourself in a Land Rover or Land Cruiser not a mini-bus and with a enough blankets for the cold Maasai Mara night's. The most popular itineraries are out of Nairobi are for three to four day Maasai Mara only, and six to seven day trips to Maasai Mara and Samburu with an over night stop at Lake Nakuru and Mount Kenya. The latter is a highly recommended alternative to the Tanzania circuit with a great range of animals and landscapes. Note that unless just after the rains, Samburu is typical dry dense bush as found in Southern Africa. The huge Tsavo NP (most easily accessed from the coast) is also dry and dense, so is Amboseli where iconic Kilimanjaro views cannot be anywhere near guaranteed. 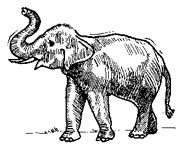 See Tanzania safari info in the respective section for more tips and advice. For the record we prefer Maasai Mara to the Serengeti since operators take you closer to the action, distances are shorter, camps are better and prices are lower. Self-drive safaris are not really an option in Kenya and are much more suited to Southern Africa, where a safari can be made much cheaper in rental cars and your own camping equipment, although don't expect to see sweeping plains, wilder beast migrations or huge numbers of predators as can be found in Kenya/Tanzania. Climbing: With your own kit Mount Kenya can be climbed independently (just hire a local guide). Even with an organised trip, a climb works out much cheaper than Kilimanjaro (although still not 'cheap'), but beware that unlike Kilimanjaro, this is quite a technical mountain with most casual climbers not getting right to the jagged top. Hot/cold, wet and dry: Normally quite hot as you would expect with the equator running right through the country. Beware both Nairobi and the Maasai Mara are at altitude and can get cold during night. Be sure to pack a good fleece and get a good sleeping bag from your tour company. Costs: About US$20-30 per day, excluding the cost of any safari or tour you take. Money: ATMs in big cities as you would expect green backed U$D cash is easiest to use and carry, although least recommended due to the risk of crime associated with carrying cash. Getting around: The roads are served by a chaotic array of Kenya's gift to the world - matatus (which have become a lot safer in the past few years with strict regulations bringing road traffic accident deaths down by 70% in 6 months! ), they make short trips easy and having compulsory seat belts and maximum occupancy means adrenaline junkies will have to go somewhere else. 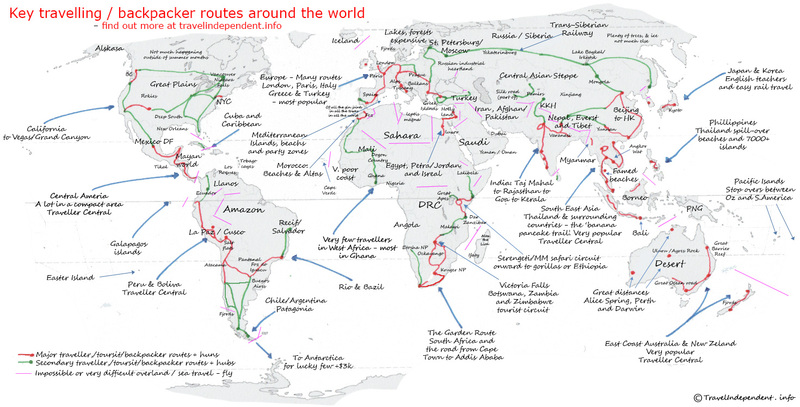 Good buses run long and international routes. Trains are subject to tourist pricing and therefore the popular Nairobi to Mombassa route is over-priced. Dangers: It's difficult to overstate the risk of being mugged, pick pocketed or conned in Nairobi especially if your guard is not up and you act as if you were visiting France (i.e. you just arrived and did not take a taxi into town). The coast is also a major target, other than that you will get the normal sticky fingers around bus stations in other parts of the country, but with common sense and luck you are pretty safe. Media: The Economist/Time plus English language newspapers available in big cities. Recommended is: The It's Our Turn to Eat by Michela Wrong as a great read for anyone interested in Kenya. Locals: Generally very nice, although on the coast they can be a good deal of hassle. Other travellers: Fine (not too many of them). Average cost: Under US$10 for a basic room US$20 for a much nicer one. International standard tourist resorts found on the coastal beaches and in game parks will be well out of a backpackers price range. Hot water: In budget accommodation, hard to get on the coast. However, you might be surprised to have a hot shower in the middle of a game park, where even on cheap tours you are very well looked after. Communications: Internet great in Nairobi and okay in most other developed parts, but can be slow. Food: Excellent food on tours, good food in towns and great Indian food in larger cities. Women alone: Generally fine, keep a guard up. Rating: 7/10 - fall foul of Nairobi and this rating tumbles, but don't get too worried, myself and most others survive it just fine and with that said probably halved the chance of having a theft problem in Africa until reaching the major South African cities. Intro: Malawi lacks the high international profile enjoyed by many of the regions other countries, but it holds a reputation of almost legendary status among travellers. A reputation, that for many whom visit and want to do more than simply relax by the lake and/or don't have the time or equipment to trek is hard to substantiate. Yet in many respects Malawi could be seen as a perfect backpacking destination - it's cheap, compact, hassle-free and in most parts very beautiful. Known as the 'warm heart of Africa' (unfortunately since the end of dictatorship, a title that appears to be slipping), Malawi is best known for it's beautiful lake, bays and beaches. It's also one of the poorest countries in Africa which adds up to some very cheap travelling, however also translates to some more expensive prices (such as imported goods) than the country's GNP would indicate. On the whole Malawi is cheap, but you can end up feeling that those items which are incredibly low in price (crafts aside) are of equally low quality. In addition when staying in one of the many lake resorts, good quality accommodation (often foreign owned) and food soon adds up. In short visiting Malawi with high expectations will no doubt lead to disappointment. Public transport can be hellish and incredibly slow plus some areas of the country are really very difficult to get to, normally requiring hiking without any support facilities. Nonetheless, if you just want to unwind from Africa, learn to dive, spend a few days on a boat or simply hang out in some great accommodation lakeside then it would be hard to be disappointed. Highlights: The lake of course; snorkeling, learning to dive or simply chilling out in resorts like Nkhata Bay or Cape Maclear. Good and very cheap trekking in Mulanje, Nyika NP and Vwaza marsh reserve. Lowlights: Transportation, poverty, the traveller resort nature of places like Nkhata and Candy Bay. Getting around: Transport is hard work and to summarise horribly, made up of five options. 1) Government buses, should technically work on a timetable, but never seem to show on time. They are very, very slow, but more spacious than the other four wheeled choice. 2) The other four-wheeled choice are mini-buses which are the most expensive, but most practical. They leave when full (and I mean full) and travel quite fast. These buses really do get VERY crowded and things can get a little difficult with a big bag. With a big bag and recommended for general comfort is purchasing two spaces (this laughably equals one 'normal' seat) or try to get the front seats. 3) Since these buses leave so full they sometimes can't pick up passengers on the way, which makes hitchhiking the only option, but do expect to pay for your ride and only travel during daylight. 4) is the Ilala ferry which operates a sort of weekly erratic service up and down the lake. Favourite for getting to Cape Maclear and to islands. The ferry is again slow and gets a little boring after the second day. Comfort, security and serenity are also questionable on the first class deck. A first class cabin is okay, but hardly a bargain. Second class is only for the brave. 5) Lastly is walking, which is the only way to see some areas and get to some places, such as Livingstonia. Not too long ago, Malawi was widely regarded to be the safest travel destination in the region. This unfortunately can no longer be said. That's not to say it should be compared to Nairobi or Jo'burg, it is just that travellers need to be alert to casual and armed theft (like anywhere else in Africa). Crime seems to be a greater problem than in cities at popular lakeside resorts, notably Nkhata Bay and Cape Maclear. Stay alert no matter how relaxed you feel, make sure your pockets don't have valuables in whilst swimming and especially guard your possessions during a ride on the Ilala ferry. The biggest question for most travellers in Malawi is should I swim in the lake? The obvious answer is yes, it's warm, crystal clear and everyone else seems to be doing it. However in the back of most travellers minds is the fact that the lake like many others in Africa contains Bilharzia which is a debilitating disease cause by tiny worms that digest their way through human and animal skin. Normally infected travellers suffer fewer problems than the some 200 million people worldwide with the illness, since symptoms (fever and wheezy cough) encourage them to seek prompt treatment and they are exposed to fewer parasites. It's commonly stated that 75% of those diving off Cape Maclear for only one week acquired the disease - whether the statement is true or not, it's a serious risk. Nonetheless, virtually everyone swims or dives in the lake and you'll be told that all you need to do is be tested upon returning home (most western doctors either don't know how to take the test or will think you might die when you mention Bilharzia) and/or just buy the simple treatment (this can be quite hard to obtain in the west especially if you don't go through a doctor). So what's the answer? Well since Bilharzia is a nasty illness, a little avoidance and commonsense is wise, along with not bathing at length in high-risk areas (those with reeds where the snails that the worms live on reside). Cape Maclear has many of these reeds, the northern part of the lake in Tanzania has fewer and you will be told that Nkhata bay (the most popular resort) has none and is Bilharzia free. This is admittedly a difficult issue and you are as equally stupid if you ignore the threat of infection as if you don't go in the lake at all. Mosquitoes: The Lake Malawi shore's and Shire Valley are among the worst parts of Africa for Malaria, particularly in the wet season. Take care and cover up at night. Visa strategy: A visa is required by all except holders of a Commonwealth, EU, USA and South African passport, and should be obtained in advance. Costs: Malawi is a cheap country and you could manage on US$15-25 per day. However, a day or two in Lilongwe and the many temptations at lakeside resorts make doubling this a more reasonable figure. Money: ATMs are available in Lilongwe, Blantyre, Monkey Bay, Nhkata Bay, Mzuzu, Zomba and several more towns besides. Most of them only accept visa card. There are still no ATMs in Cape Maclear/Chembe or Livingstonia (or its lakeshore hub Chitimba). Money can be changed at the airport and in many banks (open till 4pm on weekdays) or also at hostels. Due to inflation, locals are happy to have foreign currencies, especially dollars which will change almost anywhere. What to buy: Crafts and curio are cheaper and possibly better quality here than anywhere else in Africa. Guide book: Lonely Planet always popular. Bradt another option. Locals: Generally very warm, friendly and often so poor your heart strings are tugged. Other travellers: Standard EU, Oz and US travellers. Many Peace Corps. or volunteer workers and overland truckers in places such as Candy Bay. Tourist factor: Within resorts you will find the highest concentration of travellers, outside Egypt, South Africa, Zanzibar and Vic Falls in Africa, but in no way too many. Very easy to get away from it all. Accommodation: Outside of resorts rooms are extremely cheap, but very basic. Rooms in nice resort hostels are almost on par with South Africa, so seem expensive by Malawian standards, but dorms and cheaper options are always available. Communications: SIM cards of TNM and Airtel are widely available with cheap data packages (30 days, 2 GB, 11$). The network coverage is surprisingly good. Wireless in cheap tourist hostels mostly by skyband hotspot. Prepaid bundles of data can be bought at receptions. Free wireless in cheap accommodation is rare. Real internet cafes with computers not common with the rich locals sticking to mobile internet. Food: Very limited choice in many places apart from lake resorts where you can have pretty much what ever you want (at a price). What not to try: Right up there as one of the biggest surprises whilst travelling was fried mice being sold through the window of a bus. Still it's meat and who are we to comment without trying? Local poisons for the body: Shake Shake, a kind of maze beer bought in cartons has to be tried, for the experience at least, as it is not great (read terrible!). Malawian gold is noted by experts as some of the best pot in the world and notably strong. You'll be offered it at any of the resorts around Lake Malawi at very low prices. It's normally safe to buy with commonsense (even in one of the world's poorest countries it's still illegal) and goes a long way to explain why many travellers rate Malawi so highly and spend so long in such a small country. Intro: Two very opposed things jump to mind at the mention of Rwanda: Gorilla and Genocide. Both tend to overshadow the reason why most visit Rwanda and their expectations of it. With regards to the terrible events of 1994 and the fascinating/disturbing history of how such an event unfolded [and was allowed to unfold], the countryside is littered with reminders and monuments if you look closely. However 1994 was a long-time ago and the country has moved on - and for the better. Kigali for one is a bubble within Africa - no litter (plastic bags are banned), clean streets, no hassle, no street vendors, no stray dogs and about as safe as any city can be. For anyone wanting an 'easy' African experience - look no further (although attractions are lacking). The country is small and compact with good (although windy) roads through beautiful scenery. The northern part of the country in particular along lake Kivu and bordering the Virunga national park is breathtakingly beautiful. Stand, stare and be amazed at the 'thousand hills' green, terraced, buzzing with life, smiling children and tea, coffee, cabbages, cassava, bananas - volcanoes rising or lakes falling as a back drop. Take this away and you will note that there are not too many places to stay and actual things to do. Lake Kivu resorts are lovely but the lake can be deadly. Hotels and private transport (when you need it) are poor value compared to worldwide benchmarks. Equally after your Gorilla trek you would be forgiven for quickly heading onwards to attractions in neighbouring countries. Gorilla viewing is covered in the Uganda section and is something special, but at a price not everyone will want to or be able to pay. Is it worth it? It depends on how you value the cost. Being a few meters from a 250kg silverback is of course something amazing - but so is applying the money to further travel in the region if you are limited on funds. Rwanda is stunning, safe, friendly and easy (self-driving or cycling is a possibility). It may be slightly expensive (more so with Gorilla viewing included), but has a compact circuit with a simple visa and easy access by road from Bujumbura and Kampala. Scenery along lake Kivu (Congo Nile Trail), Kivu and of the Virunga National Park. Being face to face with a silverback. Transportation costs when you need a private car, poor value hotels and limited attractions. Getting around: Transport is pretty easy between the three main destinations of (old names): Kigali - Ruhengeri - Gisenyi. Buses leave on time and are not overcrowded. For getting around in towns take a motorbike taxi. If you want to hire a car expect prices at around $65-100/day for a 4x4. This will save you the cost of getting from Ruhengeri town to the Gorilla trek HQ and to the trail head (which would cost $50-100 alone). Driving is easy and the roads are good. Driving the Congo Nile Trail needs a 4x4 and some confidence. The road is bad and check no bridges are washed out before you leave if in the rainy season. Equally the road to the trail head of a gorilla trek will be rough and steep. There are no passenger boats on Lake Kivu. There are good and regular bus services from Kigali to Kampala and Kigali to Bujumbura. The DRC border town of Goma is easily crossed to from Gisenyi if you have a visa in place. Gorilla viewing and volcano hikes now possible from DRC side. Permit cost is lower, but overall cost is higher. Visa strategy: Available on the border or airport on arrival (although a visa on the border may only be issued for 8 days. You can apply on-line for a longer visa and bring the confirmation with you for a 30 days visa. If you are planning on also visiting Kenya, Uganda or re-entering Rwanda you can apply for an East African visa for $100 which will allow multiple entries for 90 days to all countries. You can get this at Kigali airport with pre-approval, but it is not clear if you can obtain on land borders. Typical tourist trail: Kigali to Ruhengeri and back. Some take in Gisenyi and the most adventurous take a tent and walk/bike the Congo Nile Trail. Costs: Excluding a gorilla permit US$30-40/per person per day depending on quality of accommodation. Money: Use ATMs in major towns or change USD/EUR cash. Guide book: Bradt best option if you need one. Accommodation: Good selection in Kigali (although expensive), Ruhengeri and Gisenyi (on lake shore) - expect to pay $30-40 for decent room with hot water and private bathroom. Lower cost possible, but standards drop fast. Away from main towns, poor choice/quality. Communications: Wi-Fi in hotels and data connections on pay-as-you-go local SIM cards. Reserve your permit in advance on-line and wire the payment to the RDB to secure. They will send you an e-mail confirmation which you use to collect the permit in Kigali. From Kigali you take the bus to Ruhengeri (3-4hours). You can sleep in Ruhengeri and hire a private car (~$50) for the 20min drive to the park HQ (15km) for 0700 on the day of your trip (look for others to share cost). Or you can [the day before] take a motorbike taxi to the Kinigi junction just outside town and take a mini bus from there (or ask a taxi/motorbike to take you all the way) and stay at the Kinigi Guesthouse in stunning countryside and walk to the HQ (5mins) for your trek. You do not need a tour - it is easy to arrange yourself. At the park HQ at 0700 on the day of your trip up to 80 people will assembly drink tea/coffee and get split into groups of 6-8 going to different parts of the park. If you want to see a particular group tell the guides when you sign in. All treks start away from the park HQ at the end of a bumpy track and you need to find someone in your group to give you a lift, use your own car or pay for a ride (need 4x4). The gorilla's would have been pre-located and a hike to them takes 45min to a few hours. It is up hill, but not too strenuous. You need covered footwear and clothing that covers your arms and legs (some plants sting), but don't need to go crazy on outdoor gear. You will probably be back at 1400-1600. 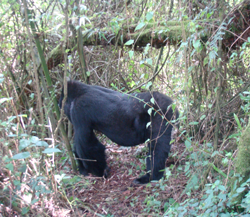 See Gorilla viewing section in the Uganda summary for general info and other options. Tourist factor: Away from Ruhengeri few tourists. Hassle and annoyance factor: 4/10 - although get use to hearing the word Mzungu and if outside of a main town being the centre of attention for local children. Local poisons for the body: Banana beer is a novelty, but not particular nice. Main beer is DRC's own Primus. Virunga a darker beer is excellent. Intro: Tanzania often comes out in reports from travellers as their favourite country in East Africa and sometimes Africa and it's easy to see why. In fact you could just reduce the country to a list of statistics: Africa's highest mountain, largest game reserve and three largest lakes. It is also the only East African country most travellers get to. Just some of the evocative names say it all: Zanzibar, Kilimanjaro, Serengeti, Lake Victoria and of course the Ngorongoro Crater - but these are not the all and even if they draw the visitors they (since these attractions are very popular with fly in visitors and very expensive) are not reason most rate the country so highly. Tanzania really does embody the African tourist dream and being such a large country, it's the ability and ease to get off the beaten track and meet some beautiful people in some beautiful places that is as much, if not more of a highlight than any of the instantly recognisable names mentioned above. Come on a two week trip or flash through and you will see (with a lot of money at your disposal) some of the prime attractions Africa has to offer and go home content. Come on a three/four week trip, still visit some big attractions, but also put up with some basic accommodation/transport to get miles from it all (virtually anywhere south of the Dar - Mwanza railway line is miles from any beaten tourist track) and you will like most come to believe that far from being overrated, this is the most underrated country in the region. Highlights: Many of Tanzania's highlights are heavily touristed and very expensive by regional standards to see, but nonetheless very impressive. Mentioned are most of the big draw cards in the introduction. Also worth noting is just how beautiful and how good walking is in the south of the country, in particular Tukuyu and the Usambara mountains. Not mentioned above and highly rated are Lake Manyara NP a gem in the northern safari circuit plus Mount Meru, an underrated (and better), cheaper alternative than Kilimanjaro. Lowlights: Tourist density and accompanying touts in Zanzibar, Moshi (Kilimanjaro) and Arusha (Northern safari circuit). Off the beaten track: roads, accommodation and English spoken all start to decline dramatically. 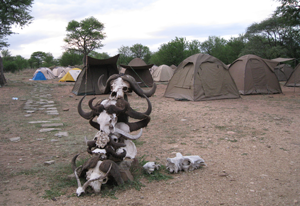 Crappy camping sites and 'production line' safaris and Killi climbs. Of note is safari operators are not allowed to drive off tracks in national parks, meaning that you don't always get that close to wildlife. Whereas in Kenya in the Maasai Mara (technically part of Serengeti) operators will take you so close to the action you might be worried you will run over the lions tail! For this reason (and others) we prefer savanna game viewing in Kenya to Tanzania. There must be over a hundred safari companies operating out of Arusha and as you would imagine competition is cut-throat. Of course you get several bad apples among lots of good operators. You would imagine it's budget travellers who get caught out the most by these 'bad apple' out-fits as it is they who try to drive prices down the most. At time of writing the cheapest rate per day was around US$150-180 and you can safely assume that if you get offered much lower than this, something's amiss. 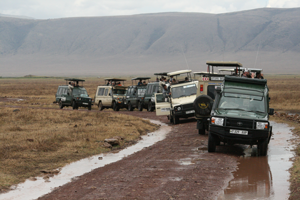 This is safari central and you can expect lots of other tourist/jeeps at almost every point of your safari. The key to great safari is ultimately your guide/driver and luck. Both are quite random. The very cheapest deals can means the highest risk, but not always. Best advice is to give yourself a few days in Arusha, use your commonsense and have a few conversations around town. You can ask the tourist office about blacklisted outfits, but operators can always operate under another name. It is also worth noting that many touts are skilled manipulators, and often pressure you into a decision by making you feel you have a one-off deal. Arriving by bus you'll get met by many touts and although they are great to find you a room, it is well worth saying you have already been on safari. If there are only two of you try and team up with another pair or your tour will cost about 50% extra and if put into a group by an agency, then it will be the choice of the operator not yours. The 'walk-in' safari industry in Arusha has much reduced in recent years and is smaller in volume than Kenya where budget travellers normally head. All guidebooks (the one pictured left being the best) have recommendations, but be warned many companies in Tanzania are NOT geared for budget safaris; don't offer camping or want to mix groups. If you are on a budget and can resist the exotic names, we think you are better off in Kenya (during low season) where camping is better and prices cheaper. Final note, as with anything, it always pays to ask for a discount, especially when things look slow. See Kenya safari info for more tips and advice. Note that high costs reflect park entry fees which the government keeps on increasing, you can check latest prices here. Hot/cold, wet and dry: Generally speaking like most of East Africa, Tanzania has a tropical climate along the coast but it gets temperate in the highlands. April to mid-May you will find long periods of rain (Green Season); Nov – Dec you will find short periods of rain. In the south, west and south-west there is only one rainy season between December and April. The warm Tanzanian summer lasts from mid-December till March, roughly corresponding with the rainy period of the south, west, and central region of the country. Winter, from June to October, is dry and cold across the country. The range of temperatures is fairly limited and always very warm to hot, ranging from 25 to 30 degrees C on the coast while the rest of the country apart from the highlands run from 22 to 27 degrees C. It goes without saying that if you plan to climb a mountain you will need warm clothing, that you will have very little use for elsewhere. Nights on the NGO crater rim or anywhere above 1750 metres will require a light fleece or other extra clothing. And on Mt Kilimanjaro and Mt Meru the night time temperatures will drop well below zero once you get above 3500 metres. Getting Around: Due to recent elections, the current government is spending a good deal of money on roads. The Dar-es-Salaam - Morogoro road has improved a greatly over the past few years, and they are extending it down to Mikumi. The Dar-es-Salaam - Arusha road shows signs of imminent construction, but that could mean anything - but still absolutely nothing is being done. The road is getting thinner and thinner which makes for some terrifying trips. A Japanese NGO has built 'the nicest road in Tanzania', which replaces the gravel/old road to Ngorogoro crater. Good surfaced roads and quick buses connect Dar-es-Salaam to Arusha, Moshi, Tanga, Morogoro and Dodoma. The road from Dar-es-Salaam to Mbeya is okayish, but most other roads are quite bad (if improving), but all roads are normally always serviced by buses. However, as with elsewhere in Africa the concept of a full vehicle simply isn't recognised! For general travel and shorter distances between towns transport is better in a dalla-dalla (mini-bus). Dalla-dallas are privately owned and usually crammed, travelling along set routes (disembark wherever you want). They are cheap and a perfect 'African experience'. Trains: There are two train companies in Tanzania, TAZARA, and the Tanzania Railway Corps TAZARA is nicer, and very safe, but the trains only go from Dar-es-Salaam south, to Mbeya, then into Zambia, to a place called 'Komperi mposhi' (sp), about 2 - 3 hours from Lusaka. Visas are available on the train. Tanzania railroads trains go west. Muggings on trains are not unknown, even when sticking close to locals. Travellers should be warned to bring a chain lock to tie their baggage in the cabins, and to keep the window locked (Tanzania railway, provides you with a wooden wedge for this), especially when going through Morogoro, and out by the lake. These trains are certainly not known for punctuality, and should not be relied on if time is critical. First class is comfortable (although different sexes maybe split (book with other travellers to share the carriage)). Air: The main domestic airline is Precision Air and Air Excel also operates between Dar es Salam; Zanzibar; Arusha and Dodoma. Websites have all details, but booking is tough (frustrating) on-line. Kilimanjaro and others: Kilimanjaro is one of the most famous symbols of Africa and the highest mountain on the planet able to be climbed with no mountaineering skills (basically an up-hill slog taking about 4-6 days with no 'technical' climbing - although some would argue Aconcagua which is higher does not require 'technical climbing, although you get a lot more ice). The challenge and iconic status Kilimanjaro presents is lost on only a few and even fewer resist it's lure and end up going for the climb. Of which certainly a proportion regret - since Kilimanjaro is in reality not just a walk and although there is nothing technical about the ascent, it is a very expensive, very hard and arduous climb even for those who are fit and experienced (ability to handle attitude helps more than fitness and better to have an extra day to alclimities than be fitter). On completion many less travellers regret the overall experience (but few would say they would repeat it), however the reality is not everyone even makes it to the top and those that do (especially on the shorter trips find the last day very, very tough). The most daunting factor for many is not the energy needed for the climb, but the cost of the whole thing, starting at about US$1000 and normally ending up at a lot more (up to US$2000 inc. trips) - note this price includes new park fees and rates porters/cooks/guides must earn, so if you see cheaper elsewhere on the net they likely don't. The reality of the matter is that government parks fees increased dramatically in the last few years. These fees are priced per day and night in the park so depending on how long you take varies the price, but at something like US$60 per day plus camping and plus rescue insurance fees, most end up paying hundreds of US$ in fees alone. This is terrible value and really doesn't offer good value considering all the amazing thing to do on the continent. You could find guys who will take you for about a hundred bucks less than most quoted price, but Kilimanjaro is not to be taken likely and the risks of doing so are considerable. If you just can't afford it, don't lose too much sleep or head north and climb the far prettier Mount Kenya or Meru close by. The mountain is cold and the sun harsh. In addition at certain times of the year it can be wet. Most of the equipment you need will be supplied or can be hired in Moshi, although it is advisable to bring a few of the essential items yourself to ensure good quality. Far less popular is Mount Meru (the fifth highest mountain in Africa) and rated by many to be a much better option than Kilimanjaro. It's a shorter (2-3 days), much cheaper, less tramped and certainly prettier climb (Kilimanjaro is quite ugly in places). Highly recommended over Killi. There are several ferries that ply between Dar-es-Salaam and Zanzibar, these seem to take turns each going once a day (so normally three trips daily - no real need to book). All these ferries charge around US$35 - 40 for tourists and much less to locals. This is blatant tourist pricing, but there is nothing you can do about it. Ferries are okay (despite one sinking in 2011), but can be rough and night trips are best avoided, but a little cheaper. However, another option is to fly, with many travel agencies offering flights (15 minutes) including transportation at both ends for not too much more than a ferry ticket. There are numerous travel agencies around Dar-es-Salaam which can also arrange travel. On Zanzibar, the Precision Air offices are downtown in Stone Town. The night ferry from Zanzibar to Dar-es-Salaam (there isn't normally one the other way), is quite comfortable in first class (the only class as a tourist you're allowed). Get there early to get a whole couch to lie on. This ferry is cheapish, and saves you from needing a hotel. Just try not to use the bathrooms! Visa strategy: It seems visas are not required by most Commonwealth and Scandinavian countries, but many EU countries, British and Americans will have to buy a visas in advance or most popular entry points - cost around 50USD. You normally get 30 days, but this is easily renewed. Although seemingly constantly in flux, at present, visa are for 3 months max, and renewing can be tricky [some say impossible without bribes]. If you are not entering the country at Dar-es-Salaam International Airport, Kilimanjaro International Airport, Zanzibar International Airport or the Namanga border crossing between Tanzania and Kenya - then check carefully you can get a visa or better still pick it up in advance within the region or at home. Note that even though Yellow Fever is not a danger in Tanzania and practically speaking 99.99% of the time you don't need this coverage for Tanzania, it is frequently checked on many entry points and worth having your immunisation certificate with you. Money: ATMs pretty widespread in towns (including Stone Town on Zanzibar). Barclays Bank now has several branches in Tanzania: Arusha, Dar es Salaam, and their newest one which just opened on Zanzibar. All of these have ATMs which accept most international cards. Never a problem to change USD travellers cheques or cash. Dangers: Muggings are really only a danger after dark in Dar-es-Salaam and Bagamoyo (try not to arrive after dark), but petty crime and scams seem to follow tourists to high concentration areas e.g. Zanzibar. Many travellers seem to let their guard down perhaps feeling safe with so many tourists around in popular areas. Overall, crime in Tanzania is not a major problem and it is normally only those who feel it is no problem at all, that fall foul of it. Costs: Budget on about US$50 to $100 a day on the beaten track. A visit to Zanzibar will raise this cost slightly and activities will completely wipe it out. See above for what to expect to pay out for a Northern circuit safari and/or Kilimanjaro climb, to name a few popular options. Like much or East Africa, when you are anywhere interesting (attractions or gateway to attractions) it can be expensive. This is normally due to the lack of cheap street food (that you would want to eat) as can be found in Asia/Americas and that accommodation is expensive. Expect around $50-70 for a basic double and more if you hit the wrong season. Other travellers: Wide range of tourists, many fly-in rather than long-term or 'travellers'. Average cost: For a basic double room, pay about US$50-60 and upto twice this on Zanzibar or Arusha. Communications: Internet cafes are scattered all over Tanzania and certainly Arusha. Internet can be slow, but is often pretty good. In tourist centers like Zanzibar you will find plenty of Wi-Fi. Food: Food on safari tours is usually great, as is that on the coast. The food market in Zanzibar Town every night is perhaps one of the best eating experiences in the world if you like seafood. Food becomes more basic off the beaten track. Hassle and annoyance factor: Safari touts are a factor in Arusha and Moshi and recommended to be avoided. Walking around major towns especially Dar es Salaam and Zanzibar town, you seem to get approached by a large number of people simply wanting to chat or help you out. These are best avoided as can sometimes lead to a nasty situation or scam. Local poisons for the body: Aside from cheap plentiful beer, grass can normally always be found where there are many tourists, especially on Zanzibar Island. Intro: 'Hey Muzungu where you go?!' You'll hear comments like that all over Africa (Muzungu, if you don't know is an expression for a white individual in Africa), but none so often as in the compact, friendly and tropical country of Uganda. Dubbed by Churchill and all tourist literature since as the 'pearl of Africa', Uganda is very much Africa (East), yet feels slightly different from neighbouring nations. For one it appears tropical and fertile in a subcontinent plagued by drought, as the savannah meets the western rainforests. Everywhere something grows and for the most part you might imagine Tarzan to come swinging out of the trees! Uganda's great benefit as a destination is its compact travel circuit and lush landscapes. Those that expect big game viewing on par with Kenya, Tanzania or even Zambia will be very much disappointed. However the draw cards in Uganda are monkeys and apes, which can be viewed with little effort (although with varying price tags ranging up to spectacular for the mountain gorillas that Uganda is famous for). A current favourite with volunteers and NGO projects, Uganda - although yet to completely recover from the international image formed by the well-known reigns of terror of Idi Amin and Milton Obote - is in fact one of the safer countries in the region and although this is still Africa and you need to always expect problems, it is easy to be disarmed by the real treat of the friendliness of ordinary Ugandans most of whom are happy to talk to you. Furthermore widespread English means fascinating windows into African life can be gained from local newspapers or striking up conversations with total strangers on buses, most of whom although a little hard to understand are happy to talk to you. Unfortunately where the country has so much going for it as a destination, the problem for many travellers looking to stretch their funds is costs. Being one of Africa's fastest growing economy's has certainly pushed up prices and equally the price of fuel (which is imported on terrible roads through Kenya and despite large oil discoveries in the country) remains more expensive than in most of the western world). However the main cause of significant [travel] expense is the proliferation - as in neighbouring countries - of foreigner pricing. Quite simply almost every notable attraction (the point of the source of the Nile for example) has an official price attached to it that is different for a foreigner than a local, of which the foreigner price is often above a comparable level to that of the developed world and at a level where anyone on a reasonable budget would struggle to accommodate. Gorilla trekking permits aside (which are the most costly and debatably understandably so), national park fees are actually slightly less than Kenya or Tanzania, (however in fairness Uganda's national parks do not hold a candle to those of Kenya and Tanzania and should thus be cheaper). However national park entry and access is still expensive and lastly almost everything that is worth seeing has a 10 to 20 fold price increase for foreigners over Ugandans - not all justifiably so. This 'problem/issue' is not new or uncommon to the region and not without merits in cases, nevertheless its extension in Uganda to almost all attractions and the widespread belief that all whites are so rich the extra cost is a drop in the ocean, means those on really tight budgets should be warned. Highlights: Chimpanzees and Mountain Gorillas. Murchison Falls. White water rafting on the Victoria Nile. Ugandans and trying to understand the country and its people/history. Lowlights: The associated price tags of some of the above. Transportation (although not notably bad for the region), is still hard work, overland buses and compound (predominately white faces and very unAfrican) nature of many of the popular accommodation spots. 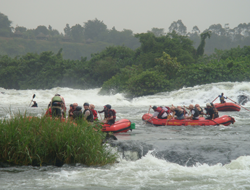 White water rafting, although priced at international levels is one of the most popular activities in Uganda. The Victoria Nile just outside Jinga offers some of the best and most accessible rafting in the world, on par with the Zambezi River by Vic Falls and the Rio Futaleufú in Chile (although not to directly compare with either, as the experience and scenery is quite different). There are several grade 5 rapids, but with little danger of hitting a rock or being underwater too long, due to many long flat stretches of water between rapids. It is not easy to describe white water rafting on the Nile because since companies (Adrift was the first, NRE came latter) started operating back in 1996 the 'experience' has changed as the water level has changed due to the construction of dams. The effect of these dams has been to raise the water level and cause some of the better rapids (the amazing 'silver back' for example will probably be history by the time you read this) to disappear. However, even with the new big dam you can still raft, only the route has been pushed further down the Nile from Jinga. Several companies run the route, all with daily departures and no need to book ahead, even in July and August with close to 400 people rafting each day you can find a spot. There are several international companies that offer the standard day trip for around US$125 and often an African run competitor with a much lower price. The standard of operation and safety from the international companies is excellent, but that of the African (local) outfit(s) is questionable. There is a good discount offered on repeat trips within a few months of an initial trip and often a bed for the night and a meal/beer after the trip is included in the price. 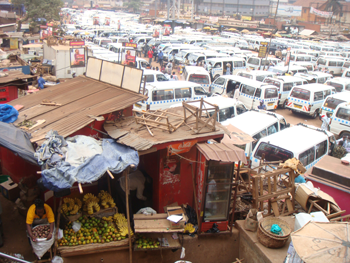 Some companies pickup and drop off in Kampala making it an easy day trip from the capital. No one should be overly worried about enjoying rafting as safety records are excellent and you can pass or take an easy route on any of the big rapids. However you must be prepared not to panic in the event you leave the raft on a big rapid since you will likely go under, and stay under for a little while. It is worth noting that probably contact lenses won't stay in and sun block definitely won't stay on - so cover up. You'll raft barefoot and need no special equipment. The rapids all have various names such as 'overtime', 'the dead Dutchman' and 'Kula Shaka' and guides are only too happy to build the suspense and anxiety before each rapid, while those rafting from overland trucks will whoop and compare grades 3, 4 or 5 rapids in a cringe-worthy fashion. Either way and despite the cost, if you can afford it, rafting on the White Nile (also known as the Victoria Nile) remains one of the most enjoyable activities in Africa and the sooner you do it the better as one day soon the new Nile dam will change it forever. 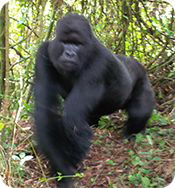 Few would pass up the chance to see a mountain Gorilla (for low land head to Nigeria) in its natural habitat, but most do pass up the opportunity due to the practicality and costs involved in doing so. Gorillas can be tracked in four different parks in three different countries; in all you need a permit - of which only a limited amount are available each day - and to part with a significant chunk of change. Bwindi National Park (Uganda): Gorilla trekking US$600 (2018) plus park entry (cUS$20 per 24hr) - there may be reduced prices for some off-season months. Six permits issued for any given day to be booked in advance through UWA in Kampala. No standby permits and unfortunately most permits are booked months in advance by organised tours. Mgahinga National Park (Uganda): Costs as above, however habituated gorillas (gorillas use to people) spend only part of the year in the park (typically Mar-May and Sep-Dec), most tours don't use the park due to unpredictability and the UWA only sells permits on-site. Parc des Volcans (Rwanda): Gorilla trekking US$1500 (2018), park entry free (fees doubled in 2017), but car hire from Ruhengeri town to the car park at the base of mountain can cost anything from US$50-100. This park is the new favourite since re-opening in 1999 and used by most over-land tours. Up to 32 permits (four groups of eight) are available daily. As of 2000-2005 you could find free permits on most days, however now it is normally booked up several weeks in advance. Permits can be booked in advance through ORTPN in Kigali or in the ORTPN office in Ruhengeri. We just e-mailed, reserved and wired the money. For your US$750 you get effectively 1 hour. That is one hour with a group of gorillas at close proximity and anything from a 20min to 4 hour hike to find the group. And of course nothing is guaranteed. Due to the cost and hassle of getting the permit, few independent travellers get to see the gorillas and most that do are on organised tours, or with overland buses that take the hassle out of getting there and the permits. Under the circumstances a cheaper option for a flavour of the experience would be chimpanzee viewing or trek in the Virunga mountains at around a tenth of the price (although Chimps flee and Gorillas stay still). Visa strategy: A visa is available on entry for around US$50. Most border points (inc. the airport) take Euro, USD or GBP. A visa is a lose term, as all you normally get is a small entry stamp in your passport. If you are a resident of a strange or developing country it is worth checking that you can get a visa on entry; nationals of USA, UK, Canada, Australia, NZ and the EU need not worry. Technically you should have your yellow fever vaccination certificate, but experience (first and third hand) suggest this is never requested/checked (certainly not at the airport). If you are planning on also visiting Kenya, Rwanda or re-entering Uganda you can apply for an East African visa for $100 which will allow multiple entries for 90days to all countries. You can get this at Kigali airport with pre-aproval, but it is not clear if you can obtain on land borders. Getting around: Getting around is relatively easy, but fraught with all the typical slowness and discomfort of African travel. Road: Although fuel costs are notably very expensive, local transport is still good value, but understandably very crowded. Buses cover all main routes. Many routes have buses with fixed-ish departures and every main route is served by an endless stream of white mini-buses that race along, stopping seemingly every 800 meters and are ramped full of passengers, chickens and luggage. However such transport can not get you into or around most national parks or many other wildlife points of interest, where you will need to get on a tour or hire something privately. The price for which can be far from reasonable especially if you are unable to share costs. Motorbike and bicycle taxis are common and useful for shorter distances. Water: Boats connect Port Bell, Kansenyi and Masaka to the Ssese Islands in Lake Victoria. Typical tourist trail: From Kenya to Jinga and Kampala. From Kampala most visitors will head north to take in the Murchison Falls NP and to Jinga to raft the Nile and see the source. Many tours and some independent travellers also take in Queen Elizabeth NP. Those with more time might head for one of the Ssese Islands or head to Lake Bunyonyi (both of which have traveller focused accommodation options). Those lucky enough to be able to trek gorillas will of course head to the Bwindi National Park or Rwanda. Costs: A very clear division must be made between someone just visiting Uganda and someone visiting and being an active tourist, that is participating in popular tourist activities. On one side simply visiting major towns and cities, costs are slightly above that of Kenya or Tanzania, but only slightly, with US$15-25/per day being quite reasonable. However those hitting the attractions and seeing Murchison Falls (US$100+/day), rafting the Nile US$120+/per day, etc. and generally being at the mercy of duel foreigner pricing and high transport costs to national parks would need a budget many times greater than US$15-25/day depending on what they did and how long they spent. Money: There are plenty of ATMs in Uganda's main cities. Not all work on international networks, but many do and getting money this way is the easiest method. There are ATMs at the airport, but they can't be counted on. No ATMs issue USD which is the pricing currency of national park entry fees and most tours and activities; converting these USD prices to UGX (Ugandan Shillings) will of course be at a less favourable rate - so having a good chunk of USD cash is useful. In Kampala there are many excellent exchange places that will change almost all world major currencies from CHF to AUD at reasonable rates, but outside Kampala and in non-business hours you might struggle to find a change place or ATM. As is normal nowadays, rates for travellers cheques are poor. Guide book: Lonely Planet is the most popular choice, despite Uganda being only a poorly covered section in the LP East Africa, until LP can be bothered to produce a dedicated edition it is best avoided unless you require the coverage on Kenya, Tanzania, et al. On the other hand Bradt provide the best option (but in no means perfects) with a dedicated Uganda only guide. Locals: How you will find Ugandans will very much depend on how far you get of the tourist trail and how much effort you make. Striking up conversations on buses is easy and generally Ugandans are welcoming. You might get a little hassle off kids and street sellers who see a Muzungu as an attraction or millionaire, but it is all fairly harmless. Other travellers: Actual independent travellers are pretty rare in Uganda, with the vast, vast majority of those you might come across having some other reason why they are in the country, which will be 9/10 times a volunteering or similar project. Being a compact circuit you do come across a few overland trucks and tours. Most travellers are aged between 20-30 and are from Canada/USA and Western Europe with an increasing amount of Israelis. Tourist factor: Uganda is far from off the beaten track in places (7/10) although as with anywhere in Africa it is VERY easy to escape the crowds. Accommodation: In all major backpacker stops such as Jinga, Kampala, Murchison Falls, the Ssese Islands or Lake Bunyonyi there are one or many backpacker places (or compound would be a better description). These are not particularly good value or worthwhile, however they do offer a good information point where you can arrange tours, get questions answered, stay safely in a dorm and meet other travellers (Red Chili's would be a good example and the better option in Kampala). Sometimes an overland truck can be in town and you would rather wish you were anywhere else and equally after a while you might question why you came to Uganda to sit around drinking beer behind a high compound wall surrounded by white faces. Conversely outside tourist areas there are some great places to stay and some terrible ones. Uganda is full of foreign owned accommodation which is always a great standard, but rarely a bargain. Almost all rooms have mosquito nets, but good to have your own treated one. Power cuts are frequent and an average cost for a double would be US$10-20. For the most part forget hot water. Media: There is a wide selection of local English language newspapers and in Kampala international newspapers and international news magazines. Many of the backpacker pads have DSTV. Communications: For what it is worth internet is fairly widespread and it is not too difficult to locate an internet connection. However connection speeds are slow and even in major cities you will be hard pressed to find anything near the sort of connection speed you need to comfortably use the internet. Food and drink: This is the land of matoke which is an incredibly bland banana dish (made from cooked and mashed plantains) which is usually eaten with bland meat or a groundnut sauce. Chicken, goat and sometimes fish are common and so are rice and potatoes (always called Irish potatoes). Any large town has a westernised restaurant and backpacker joints normally serve very familiar food. Local beers are cheap and surprisingly strong with the 'Nile' brand leading the pack followed by the milder 'Club'. Vegetarians: Normally always able to find an option, although many menus are dependent on chicken, goat or fish. The more rural you go the more you can/will struggle and end up sticking to 'side dishes'.